Necklaces: to each woman her own. Find out which one to choose between simple rigid ones, statement necklaces, chokers and pendants. There’s one for every neckline! Necklaces are back in fashion like every summer, being as always the accessories that most influence the style of your look. May they be minimal, precious or with a vintage feel, necklaces will catch the eye, giving any outfit that extra flair. But it’s often not easy to choose the right shape, material or color to match with your look. Did you know that every neckline has an appropriate necklace model to go along with it? Paying attention to the proportions is very important: pick sophisticated models for wide necklines to highlight your cleavage. On the contrary, if both neck and shoulders are covered up you can pick smaller and more delicate jewelry, in line with your outfit. Ranging from minimal ones to oversized collars, going from short necklaces to long precious pendants, here’s how to pick the perfect necklace according to the neckline. If the neckline is round and classic, choose a simple choker, made even more special with a small pendant, maybe even layered for a more formal look. If you decide to wear a collar shirt then short thin necklaces will do the game. You can add a small charm that will peak out when the shirt is open, for a more conservative but always stylish look. What if the cleavage is on the back? Try with a summer must have you can’t miss: the scapular necklace. A precious jewel to wear on your back (seen on many catwalks!). The final effect will be super feminine and sensual! A squared out neckline instead will be highlighted playing with shapes and proportions choosing a rigid collar, like our model, 9 baton bombee. A boatneck cleavage leaves shoulders and neck in sight. Perfect, in this case, are the rigid necklaces or the chokers. Fashionable in the 90’s, these necklaces have become popular again in these last years amongst all the IT-girls. To be worn tone-on-tone like a scarf with your favorite look, or to be matched with a T neck top. Thumbs up for the choker net waves. 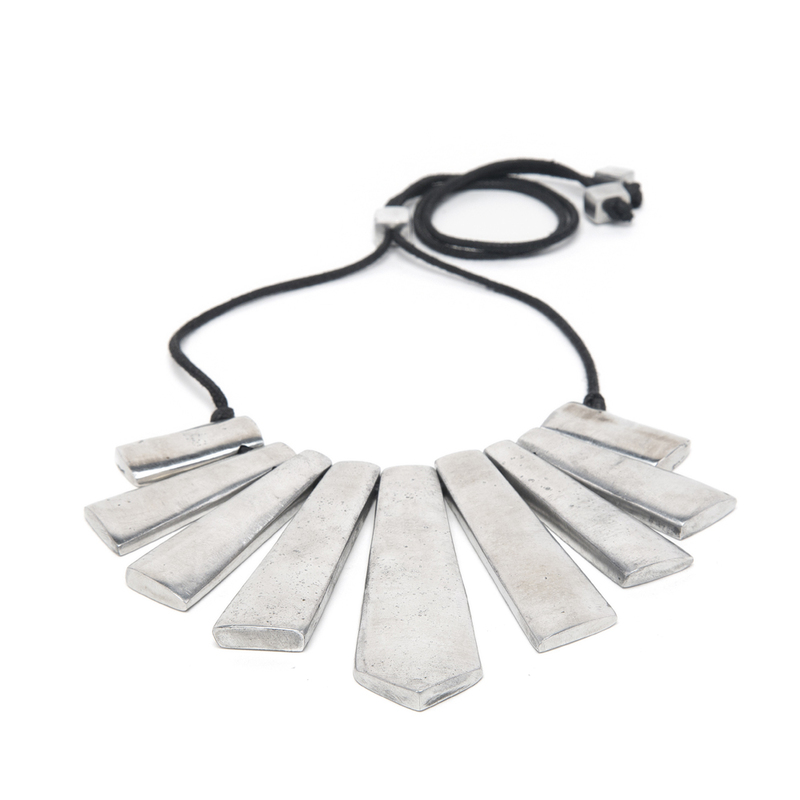 Have a browse through Vestopazzo’s aluminium necklaces: offering many models of rigid necklaces to have no matter what. 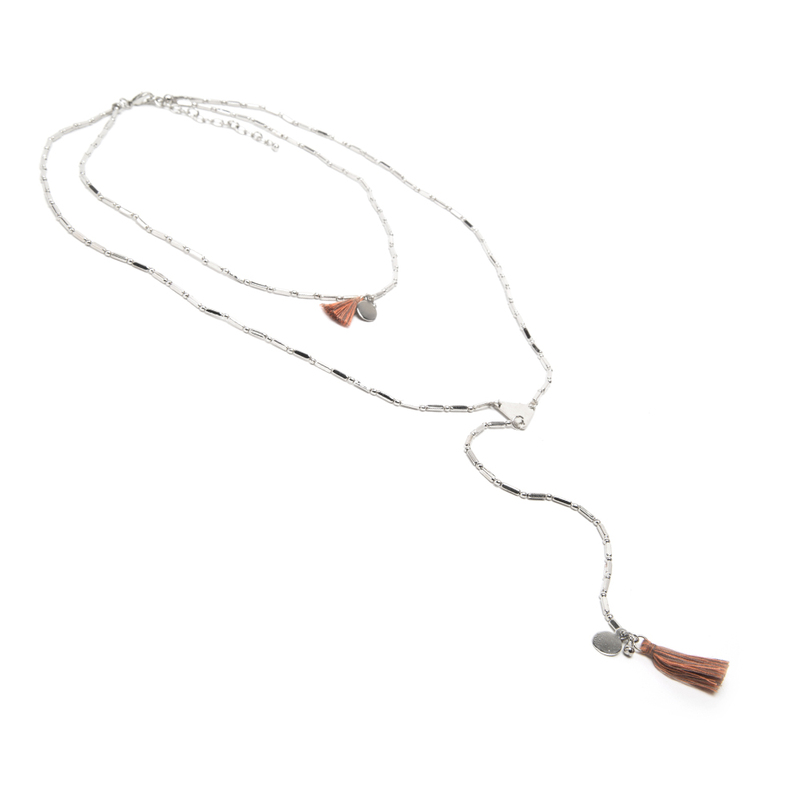 If long necklaces are your favorites, then you’ll have to try a V neck. You can opt for a Y necklace micro triangle bars. That extra touch? Match different types of pendants for a glam effect! To be worn also with a bathing suit during a beach front aperitif. For those that don’t like to go unnoticed, the necklace flower fringes is extravagant and summery. Perfect worn with mini white dresses or lace caftans. What about you? Have you already found your favorite necklace in our jewelry collection?